WASHINGTON — The body of Justice Antonin Scalia will lie in repose in the Supreme Court’s Great Hall on Friday. The court announced that the public will be invited to pay its respects Friday from 10:30 a.m. until 8 p.m. The details came Tuesday as the former jurist’s courtroom chair was draped in black to mark his death as part of a Supreme Court tradition that dates to the 19th century. Court officials also draped black wool crepe over the entrance to the marble courtroom and the mahogany bench in front of Scalia’s chair. Flags on the court’s front Plaza will be flown at half-staff for 30 days. Funeral plans still have not been released. 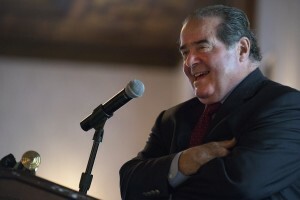 Scalia died Saturday at age 79. He joined the court in 1986 and was its longest-serving justice.